Bobux shoes have always been a favourite in this house, in fact the Bobux Xplorer shoes were Mini KidTown's first walker kicks a couple of years ago. Recently, The New Zealand based company has developed a new range of custom shoes that are perfect for creative little adventurers. The Bobux Custom shoes are white with sweet little cartoon animals printed on the outside. 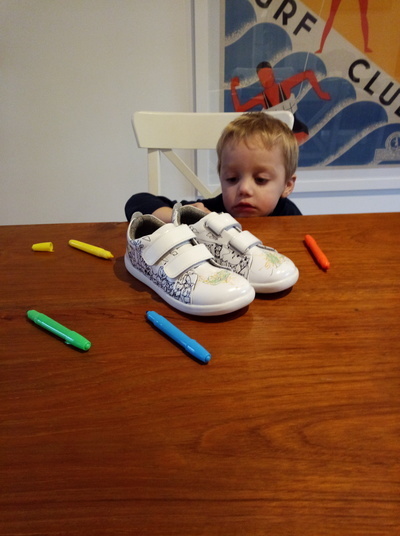 The trick with these little kicks is the ability for your child to colour-in their own shoes! Bobux Custom shoes come complete with a set of five colourful pens so that your child can colour-in to their heart's content before donning with their favourite outfit. The beauty of these sweet little shoes is the ability for your kids to wipe their designs clean off and start all over again when the mood takes them. Bobux Custom shoes can be wiped clean with a wet towel or a baby wipe. We were sent a pair of Bobux Custom shoes to trial. This couldn't be better timing really, because I was at a bit of a loss of what to get for my nephew who turns 4 years this August. What better than a gift with practicality (every kid needs shoes!) but with a little creativity thrown in. While these shoes are winging their way to the UK where my nephew lives, Mini KidTown had a go at colouring his cousin's shoes before I popped them in the post. 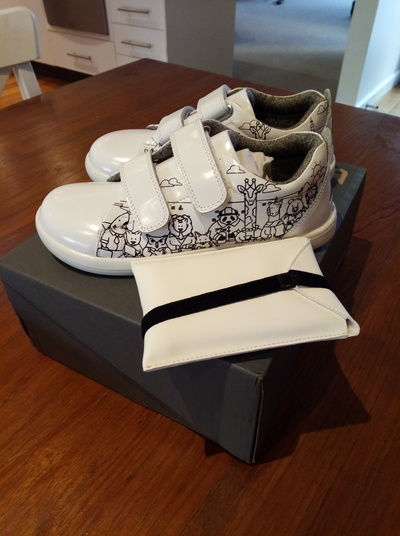 Sure enough, after a couple of baby wipes these shoes wiped clean and are now ready for my nephew to colour-in his own kicks when they arrive in his mailbox. These limited edition Bobux Custom unisex shoes are available in sizes 27 - 33. Would you like to WIN a pair of limited edition Bobux Custom shoes valued at $105? To enter, simply head over to the Bobux shoes website and tell us which size your child would wear. Check the sizing chart HERE. Then jump over to the following Facebook post and tell us which size your child would wear and why you'd like a pair of Bobux Custom shoes in the comments section. As always, GIFs are encouraged in your answers! This giveaway is open to all Australian / NZ residents and must end AEST 5pm on Sunday 6 August, 2017. The winner will be contacted via Facebook.